Two weeks into Kenya’s risky attack on Somali extremists, the Kenyan military is warning civilians to expect air raids in the vicinity of 10 Somali towns. The heads-up itself is not unusual. What is unusual is the medium: Twitter, the short messaging service. “BAIDOA, BAADHEERE, BAYDHABO, DINSUR, AFGOOYE, BWALE, BARAWE, JILIB, KISMAYO and AFMADHOW will be under attack continuously,” Maj. Emmanuel Chirchir, a Kenyan military spokesman, Tweeted on Tuesday afternoon. In an interview with the BBC, Chirchir clarified that the attacks are targeting extremist camps near the listed towns. Chirchir seems to recognize that few residents of these impoverished communities possess Twitter accounts or reliable Internet access. “The Kenya Defense Forces urges anyone with relatives and friends in the 10 towns to advise them accordingly,” he added in a subsequent Tweet. The warning comes two days late for some Somalis. On Sunday Kenyan jets struck a suspected extremist base near Jilib. Five civilians reportedly died in the attack. In yet another Tweet, Chirchir blamed the deaths on extremists indiscriminately firing a ZSU-23 anti-aircraft gun near a refugee camp. Kenya’s air force is notoriously inexperienced and dilapidated, even by the modest standards of East African air arms. The air force possessed roughly 18 U.S.-built F-5 jet fighters dating from the 1970s, two of which have already been destroyed in the Somalia fighting. The F-5s, similar to those pictured above, apparently carry only unguided bombs. A lack of pilot training could compound the bombs’ poor accuracy. 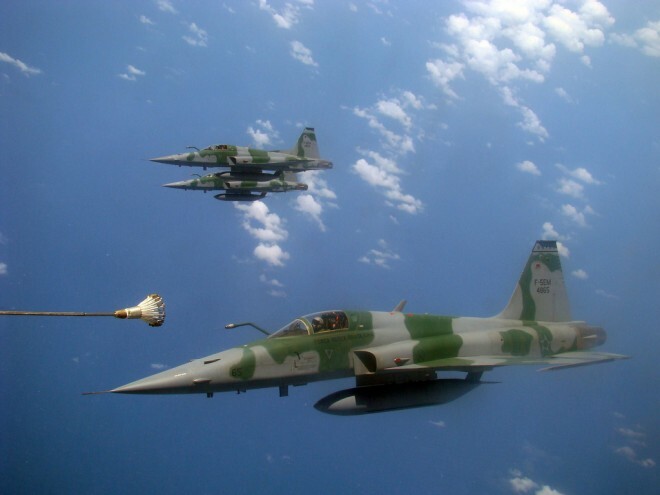 While the U.S. has been flying Reaper spy drones over Somalia from a newly-disclosed base in Ethiopia, spotting extremist targets, it’s not clear that the drones can interface with the F-5s the way they do with U.S. jet fighters. That means Chirchir isn’t joking when he takes to Twitter to warn civilians in Kenya’s line of fire. With Kenyan jets incoming, you’d best duck and cover.